HAPPY RAJA TO ALL MY ODIYA FRIENDS!!! "Raja" is the most important and unique festival of ODISHA. It is celebrated for 3 days continuously, as Pahili Raja, Raja Sankranti and Sesa Raja or (Bhuin daana). Celebration of Raja is one of the oldest tradition of Orissa. The festival is also associated with the Oriya delicacy of "pitha" (dough cake) which is prepared in almost all household. In the first day of Raja, I have celebrated it with one of my favourite dish from my mom's kitchen. This is first time,I have made it myself and it tastes mind blowing..just wow!!! The best combination with Pitha is ghugni and chana dal chutney. So frndz please must try it in your kitchen....its very simple and easy to prepare! Soak rice and black gram in water in separate bowls for about 6 hrs. Clean and wash them thoroughly and then grind into a thick batter. It need not be a fine paste (as like as Idli batter). Mix well and leave it for fermenting for about 7-8 hrs. Add salt and mix well. Now for stuffing preparation, heat oil in a pan. Add panch phutana to it. When it crackles, add chopped onion, ginger -garlic chopped, green chillies and fry for a while. Add chopped potatoes to it and mix well. Add turmeric, salt and stir it. Keep it covered for 2-3 mins. Now add roasted saunf powder and mix it well. Don't over cook the potatoes because it will again cook with batter. After few seconds switch off the flame and keep aside. Now for preparing pitha, steam it in the traditional way. Take one wide mouthed pot (handi/dekchi), fill it upto half with water. Cover the pot mouth tightly around with a cotton cloth and let it bring to boil . Now add a layer of the batter about 1-2 cm thick over the cloth, spread potato stuffing (aloo masala) over the batter and again add a layer of batter to cover the masala about 1 cm thick. Cover the pot with a concave shaped lid and steam it in a high flame for 15-20 mins. Check it and switch off the flame. Let it cool in a normal temperature and cut it in your desirable shape and serve with ghuguni, dalma, chutney etc. NOTE :- You can also prepare this pitha in idli stands as above my picture. 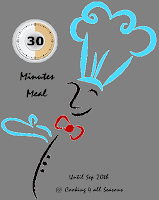 "30 Minutes Meal Mela" hosted by Srivalli. "Show Me Your Hits -Rice Event" hosted by Vardhini. Thanx Jagruti for your lovely comments..
Learnt something new .. thx for sharing and linking.